EURUSD remains in the downtrend from 1.1448, the bounce from 1.1183 is likely consolidation for the downtrend. 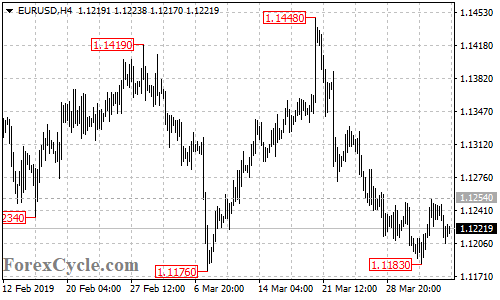 Key resistance is at 1.1254, as long as this level holds, the downtrend could be expected to resume, further decline towards 1.1150 is still possible after the consolidation. Only break above 1.1254 resistance would indicate that the downside movement had completed at 1.1183 already, then the pair would find next resistance at around 1.1300.